We are family owned and operated and committed to offering only the finest floral arrangements and gifts, backed by service that is friendly and prompt. Because all of our customers are important, our professional staff and floral designers is committed to making your experience a pleasant one. We always go the extra mile to make your floral gift perfect. We specialize in weddings and party designs and are known for our quality and service. Colman Florist is a local Rock Island, IL florist. We deliver to Rock Island, Moline, Milan, Coal Valley, East Moline, Silvis in Illinois, as well as Davenport and Bettendorf in Iowa. 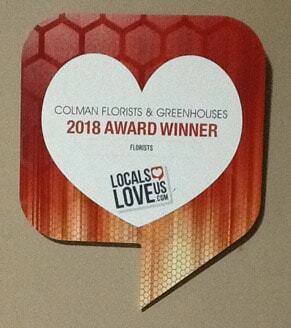 Let Colman Florist be your first choice for flowers! If you have any questions or need more information, please call us directly at (309) 786-4433. We're always here to serve you and make your flower-sending experience a pleasure. 8:30 a.m. to 3:00 p.m. on Saturday. We are closed on Sunday but will deliver to local funeral homes. Wheelan-Pressly, Esterdahl, Rafferty, Trimble, Wendt, DeRoo, VanHoe, Sullivan-Ellis, Schroder, Runge, Halligan McCabe Devries, Weerts, Orrs and McGinnis. We are unable to make home deliveries on Sundays. We will deliver to local funeral homes on Sunday. Delivery of orders to rural route addresses cannot be guaranteed. Cemetaries delivery can be made if gravesite location is available. Occasionally, substitutions may be necessary to create your bouquet due to the availability of certain flowers in various parts of the country. Care is taken to maintain the style, theme and color scheme of the arrangement, using flowers of equal value. Additionally, the substitution of certain keepsake items may be necessary due to increased demand, especially during major holidays. If there is a need for substitution of a keepsake container you will be notified for your approval. 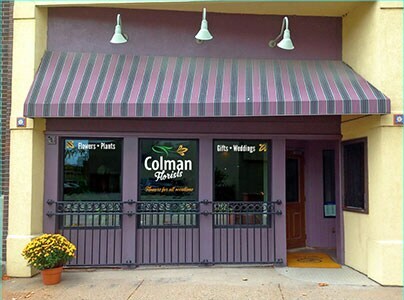 Started in 1933 by Ray And Elodie Colman, Colman Florist was located on 12th Street in Rock Island, IL for over 80 years. In 2015, we moved to our current location in downtown Rock Island. The business is still owned by the Colman Family and is currently managed by Ray and Elodie's daughter, Patricia.